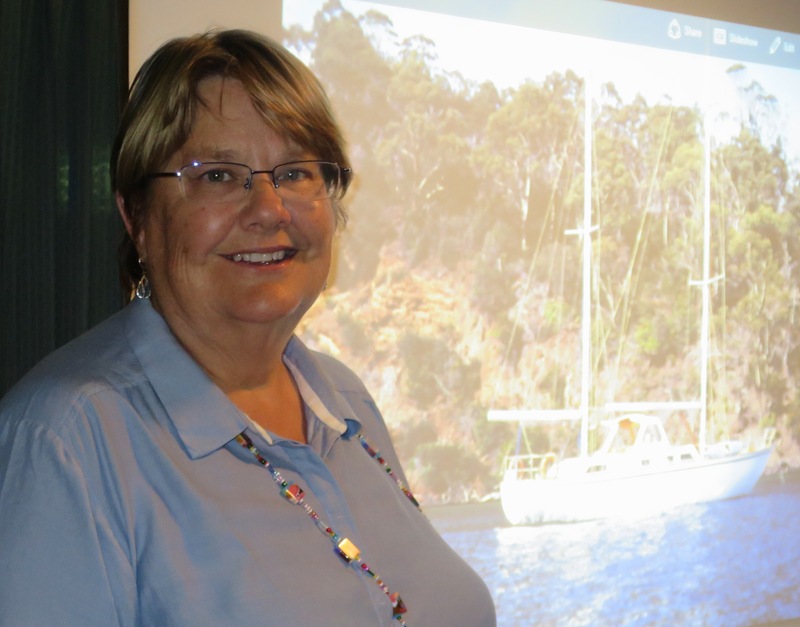 December 2016 – Narooma Rotary Club Inc. It has been another relatively quiet Rotary week for me. Last Wednesday I attended the last planning meeting for the upcoming race day at Moruya. I hope to see as many Rotarians as possible attend the race day on Sunday 18 December as it is a huge fundraising event for the three Eurobodalla Rotary Clubs. Last Wednesday also saw me selling duck tickets at IGA and again the feedback from the public about the work of Rotary in our community was excellent. boat from scratch. The 6 years it took to construct the boat must have been really hard work but it obviously gave her fantastic memories and skills. Thursday also saw us having our final meeting at the Whale. Jen and Matt were having a well-earned rest so we could not thank them in person for the support they have given week in week out to our club for many years. Jen told me earlier that our club has been meeting at the Whale since they came to the motel and for many years before that (Since 1999 – Editor). After our Christmas Party at Casey’s this Thursday our next formal meeting will be 2 February 2017 at the Narooma Golf. 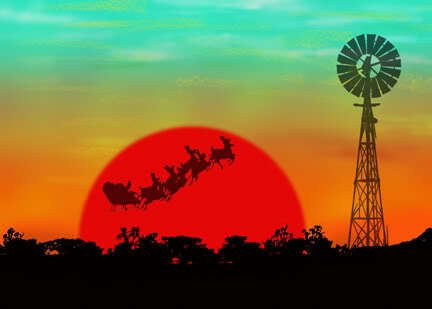 Finally, I wish all members and their families a relaxing and enjoyable festive season. 16 members were present, along with regular guest, Iris. build a sailing boat – back in the 70s. It was an activity that had all the family working together on and off on weekends for more than 6 years to build the boat. Charmaine’s dad was not an experienced sailor or boat builder, however, he and the family persisted to build a beautiful craft that has given the family many hours of enjoyment. The boat is still in the family with Charmaine and her brother planning to sail her from Hobart to Sydney in January. Bob Aston gave a three-minute talk on his experience as a scout attending a World Jamboree in Japan as a 15-year-old. John Rungen proposed the International Toast to District 5500 in recognition of that District’s efforts to raise funds to end polio by conducting a bike ride. President Michael updated us on his fund raising efforts (for has 1000km walk) to end polio. He encouraged all members to share his Facebook posts promoting the walk. Other news including the fact that the Expo made about $1000.00 profit and RYDA is scheduled for 3 and 4 April 2017. 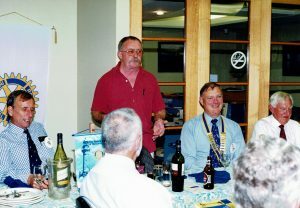 Narooma Rotarians are needed for 4 April. Did you know THE ROTARY FOUNDATION has been named the 2016 Outstanding Foundation by the Association of Fundraising Professionals? Did you know that your personal contributions increase your PHF recognition amount to the same value AND give you PHF points at the rate of one point per dollar which can be transferred to create a new PHF or PHF level? Did you know that you can view your own personal giving progress to THE ROTARY FOUNDATION via “My Rotary” on the Rotary International website at www.rotary.org. Vaughan Bridgeman a former host at the Whale addresses a 2001/2 meeting. Also in the picture, Bill Hardie, James Denny, Bob Aston and George Barker. Last week’s meeting was the last one at the Whale before we move to the Golf Club early next year. The Club has been meeting at the Whale since the Lasallian Centre Motel kitchen and dining room were destroyed by fire in December 1999. During the 17 years we have met at the Whale we have been fortunate to have been looked after by many managers and owners, most notably Vaughan Bridgeman, Robert and Michelle Wignall (Robert was a member of the Club) and Matt and Jen. Thank you to Matt and Jen and the staff at the Whale for serving us for so many years. It’s time to celebrate – yes it’s the annual Christmas Party, this time at Casey’s. Normal start time, please remember to bring your own drinks. This will be the last edition of the Beacon until our first formal meeting of 2017. 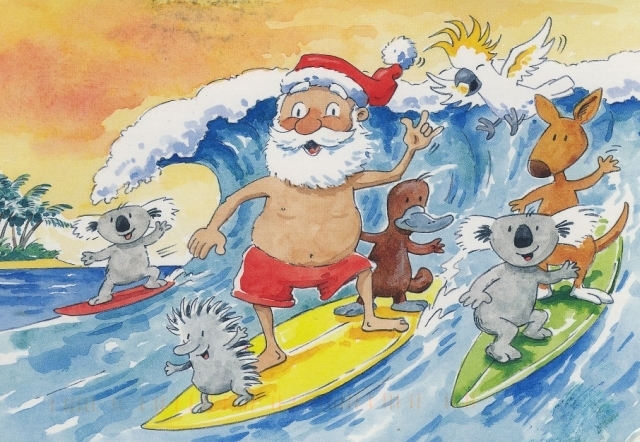 Keep an eye out for emails to keep us informed of holiday events and activities. Fortunately, this Rotary week was a much quieter one for me and members following on from the very successful, yet hectic, Renewable Energy EXPO. What was most pleasing for me as president was the number of people who came up to me to THANK ROTARY for putting on the Expo. They thought it was great and it was something that was really needed in the town. It was also mentioned how seeing Narooma Lions cooking up a storm was great, demonstrating that cooperation between service clubs in the town was alive and well. The buzz was reflected in the great news coverage in the Narooma News. Not only did they publish great stories about the Expo our Meals on Wheels meeting also got a run. These articles demonstrate that the Rotary Club of Narooma is active and productive in the community. On Thursday we had our AGM and Board meeting which was well attended. Mark Wallace our District Governor elect (2017/2018) and Janet from Canberra South ( hope I got that right) were surprise visitors to the Club. 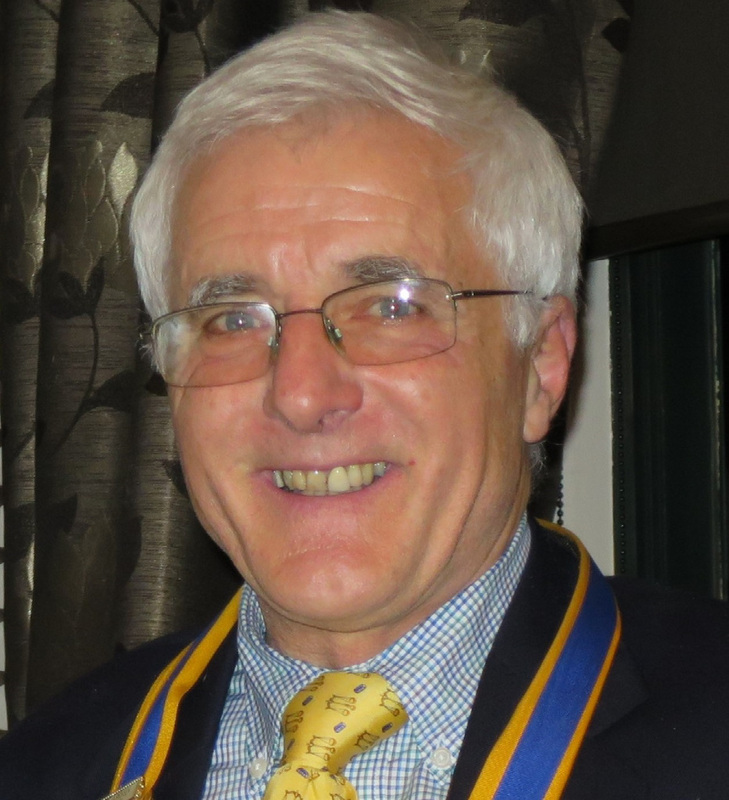 Mark let us know his plans for the District and in particular his desire to get more female members into Rotary. Bob Aston has been appointed to the Board as President elect and the election at the AGM voted in Laurelle Pacey as Vice President, Sandra Doyle as Secretary, Lynn Hastings as Treasurer with Peter Bull, Lynda Ord, John Doyle, Chris O’Brien and Frank Eden as Directors for 2017/2018. 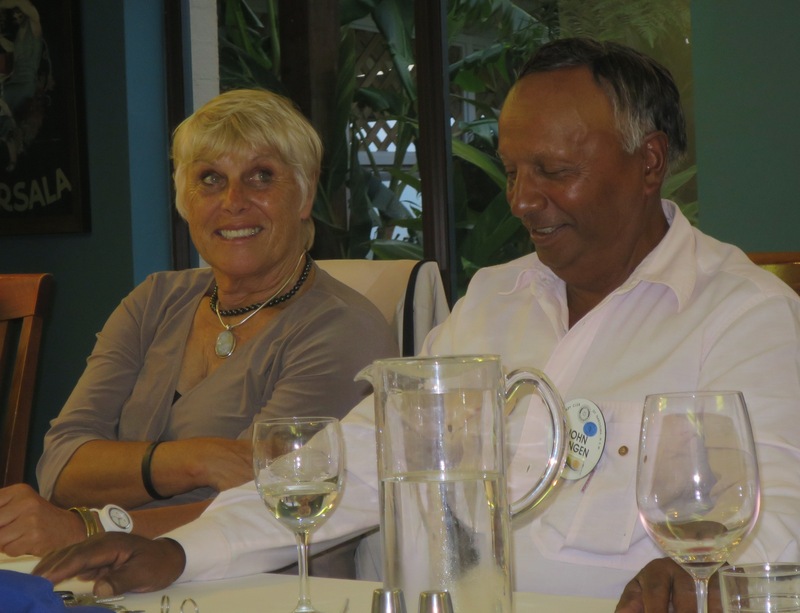 Finally, it was announced that the club members decided unanimously to continue our weekly meetings as dinner meetings with a move to the Narooma Golf Club for meetings commencing in February 2017. 13 members were present and we had two guests. DGE Mark Wallace and Janet from the Canberra City Rotary Club. Mark gave us a brief overview of his plans for the 2017/18 Rotary year. 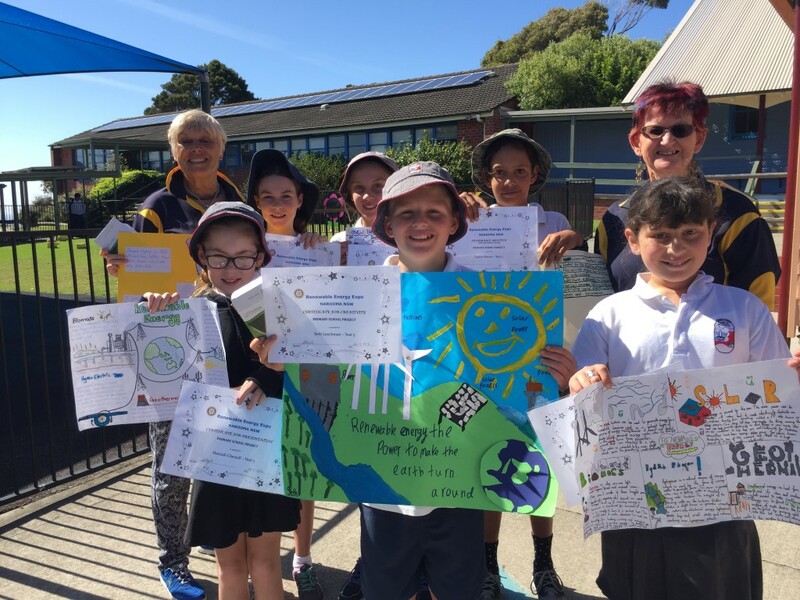 These include increasing the number of women members, Rotary Clubs working together on projects and activities (a bit like Narooma, Moruya and Batemans Bay) and greater interaction with Rotract and Interact Clubs. Mark indicated that hopes to visit at least one of our Rotary Markets and to help out where he can. Mark also encouraged us to send a strong contingent to the 2017/18 District Conference that will be held at Chevalier College Bowral on 6, 7 and 8 October 2017. As it was the AGM for the Club, various reports for the 2015/16 year were presented and adopted. Club Secretary, Rod Walker has emailed a copy of the minutes and auditor’s report to members. As President, Michael has indicated the 2017/18 Board was also elected. Angie Ulrichsen also mentioned that she had been in contact with one of our Rotary Scholars, Maia Zuco. Angie told us that Maia had just completed her honours year at Macquarie University in Psychology. Her honours project included a research thesis validating a new system for measuring electrical brain responses. Maia was awarded first class honours for her study and research. Maia has won a University Scholarship to undertake a Masters of Clinical Neuropsychology. Another example of the great outcomes we get when we invest in young people from Narooma. Layton Moore- Honourable Mention for Understanding. I understand that due to the high standard of entries the judging panel of 5 of the Expo Committee members found it extremely difficult to come up with the winners. A young executive is working late one evening. As he comes out of his office about 8 pm, he sees the Big Boss standing by the shredder in the hallway, a piece of paper in his hand. “Yes, sir,” says the young executive, who turns on the machine, takes the paper from the Big Boss and feeds it in.